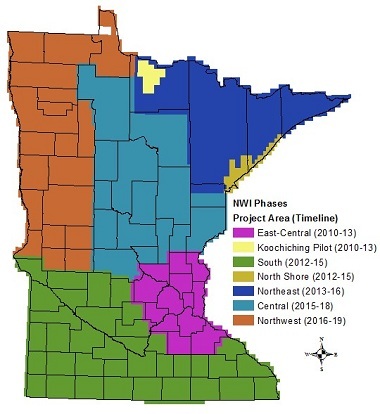 The Minnesota Wetland Inventory is a publicly available GIS database that provides information on the location and characteristics of wetlands in Minnesota. It is based on the framework for the National Wetlands Inventory (NWI). These data are used in wetland regulation and management, land use and conservation planning, environmental impact assessment, and natural resource inventories. The NWI has been used to assess impacts of regulatory policy, identify flood storage, evaluate carbon storage potential and climate change impacts, and estimate waterfowl and amphibian population distribution. The original NWI was completed for Minnesota in the early to mid-1980s under a program of the U.S. Fish and Wildlife Service. The DNR, with funding from the Environmental and Natural Resources Trust Fund, began a statewide update of the NWI in 2008. The wetland inventory has been remapped using the GIS technology, including lidar and high-resolution aerial imagery, making it the most comprehensive, current, and accurate wetland inventory in the country. Project oversight, coordination, and quality control of the NWI update were provided by the DNR. Ducks Unlimited provided mapping services for east-central, northeast, and central Minnesota. St. Mary's University of Minnesota provided wetland mapping services for southern and northwestern Minnesota.